After learning that there were two versions of the Ardbeg Perpetuum, we’ve been anxious to do a comparison tasting and now we’ve finally done it! Just in case you are unaware, Ardbeg first released the Perpetuum Distillery Release (~£70) some time in March of this year. As the name suggests it was only available for purchase at the distillery but they made a small number available online to UK Ardbeg Committee members. 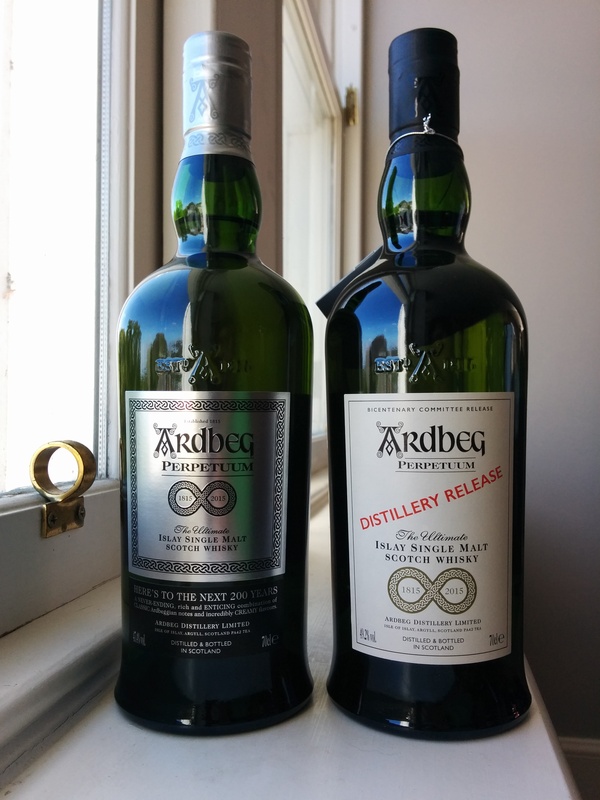 The Standard Release (~£85) was made available at Ardbeg Embassies on Ardbeg Day (May 30th). They are supposedly from the same vatting but diluted to different ABV’s (DE 49.2% vs SE 47.4%). While they are both Non-Age Statement whiskies, a range of casks from the very old to the very young were used to make these expressions. The idea behind the cask selection was to impart character from all of Ardbeg’s history. An interesting concept for sure, but how does that translate to taste? For this review, both TheMadVatter and AliceInWhiskyland chimed in to give two perspectives on the two versions. Meaty savoury dish like Japanese Katsu curry (a bit of cumin and tumeric). Slight bit of rubber notes. Moderate levels of peat. The smokiness is like burnt toast. Some sweetness like sweet Taiwanese pork jerky. Bit of red berries. Also a bit of dry white wine. Maybe Chardonnay. Mellow sweetness like diluted maple syrup. Sweet cream. Peat on the high end that is somewhat gentle but present all throughout. Spicy toward the end with an herbal licorice twist. Tobacco herbal notes. A spicy bitterness. New oak. Bit of rubber but not quite sulphury. Rich peat with a hint of salted caramel. Wild fire. Peaty snap cooling down to roasted almonds. Bacon with honey or maple syrup. Smoky like charred meat but not very dominant. Just kind of mixed in with the other smells. Bit of floral notes and grass. Rubber like rubber gloves from start to finish. Mixed in with the rubber are herbal notes. Peat is not very strong in the taste but does linger in the background. Wet earthiness like digging loose soil after the rain. There is a cool taste like chewing mint gum but it is not quite minty. There is a bit of berry jam in there too but kind of hidden behind the other flavours. Herbal bitterness. Light syrup aftertaste. The cool taste lingers. It’s almost like the cool feeling from from irish springs soap bars. Just like a refreshing sensation. Smoke fire from the BBQ. Wood burning in the distance. Some acidic notes such as pineapples. Moderate peat. Trouble picking up much from this one. Some bitterness hidden in a sweet finish. Medicinal. Remind me of crushed paracetamol in a spoonful of honey. If you like the Uigeadail or Corryvrecken then you might not like this. It’s definitely not what you would expect from Ardbeg. It’s reserved and soft and mellow, not big and punchy and fiery like some of the standard expressions. It’s not a bad dram but just doesn’t seem to fit into the Ardbeg lineup. As for the Distillery Release versus Standard Release, I found the Distillery Release to be more enjoyable. The flavours seemed to be more accessible and balanced in the distillery release while the standard release seemed more one dimensional to me. I have heard from one of the Ardbeg reps that they are from the same vatting but just diluted to different ABV’s. I am not entirely sure of this upon tasting them. They do seem similar but not close enough to be from the same vatting. Presumably if they were from the same vatting diluting the distillery release just a touch should make it taste like the Standard Release but that didn’t seem to be the case. I tried the Corryvrecken and Uigeadail after these and I found them to be more enjoyable, but I do like those bold flavours so maybe the Perpetuum is for the tamer of palettes. Both the the distillery and the standard release were disappointing. I was expecting more from a special release of Ardbeg. The Perpetuum is a nice dram but nothing really special. I prefer the distillery release over the standard as it was more complex. A good dram if you want something moderately peaty. But if you are looking for anything more than that there are much better options with better price points.